Tiffany had been planning to eventually overhaul her outdated kitchen anyway, but unexpected flooding caused by burst pipes fast-forwarded the need for renovation. She recruited actor Kat Tingum, a friend and fellow recycling aficionado, to come along on her green makeover adventure. 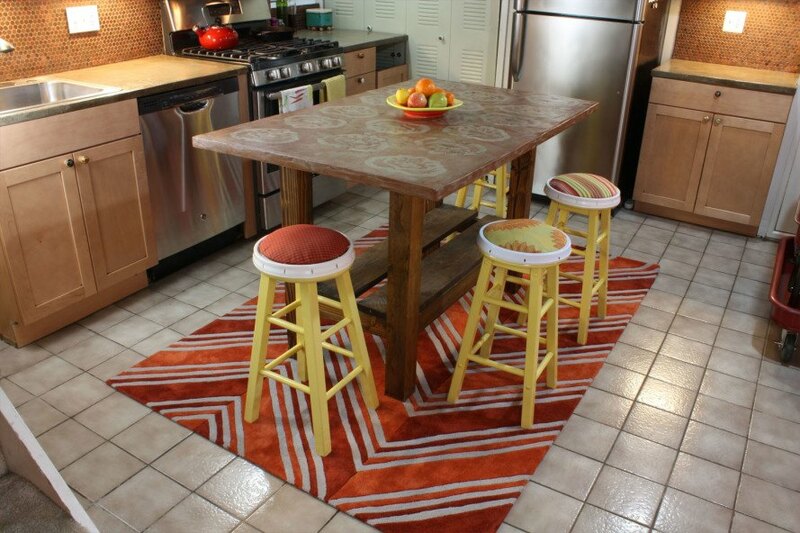 The shimmering new backsplash is clad in $30 worth of pennies while old bucket lids and scrap fabric were whipped into new cushions for Tiffany’s wooden stools. Three red wagons were transformed into a playful new minibar. Tiffany and Kat used a cement overlay combined with a natural coffee stain and food safe finish to refurbish her dated countertops. New appliances were sourced from a scratch and dent store, saving Tiffany 30-40% off of retail, and the old cabinets and old but still working appliances were sold through Craigslist. “I am loving my new kitchen and am proud of the fact that it was created from loads of love, sweat, and salvaged materials!” says Tiffany. Don’t forget to check out our full photo gallery for more of the fun details that can be found in Tiffany’s new kitchen. Hey jrt256! I sourced EnergyStar appliances and purchased them from a Scratch and Dent store. So appliances were definitely considered and I used the most energy efficient ones that I could find. My electric bills have definitely decreased since my kitchen update! I found it odd when this was supposed to be Green that they bought a new gas range and what doesn't appear to be a high efficiency refrigerator. 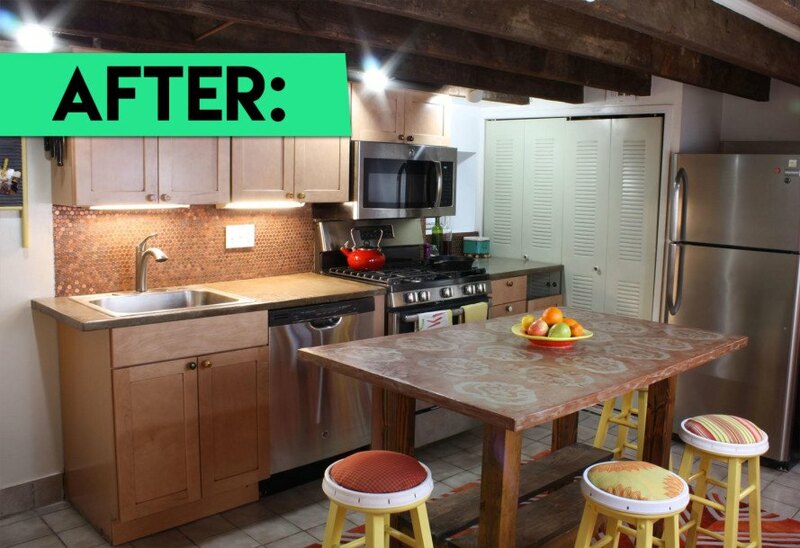 DIY diva Tiffany Threadgould serves as the "Chief Design Junkie" at popular recycled product company TerraCycle, but now she can add "Green Kitchen Makeover Guru" to her resume as well. With the help of her friend Kat Tingum, Tiffany recently completely an eco-friendly revamp of the rundown kitchen in her Philadelphia home, generating just one 55-gallon trash can of waste in the process. 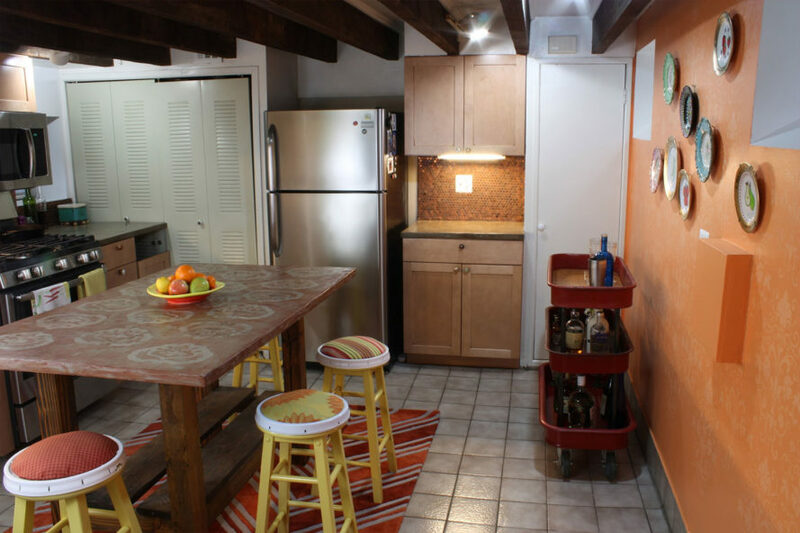 The resulting space features a bevy of fun and quirky upcycled touches from a mini bar made out of red Radio Flyer wagons to a priceless backsplash made of real pennies, and was documented on an episode of the show Renovation Realities on DIY Network. 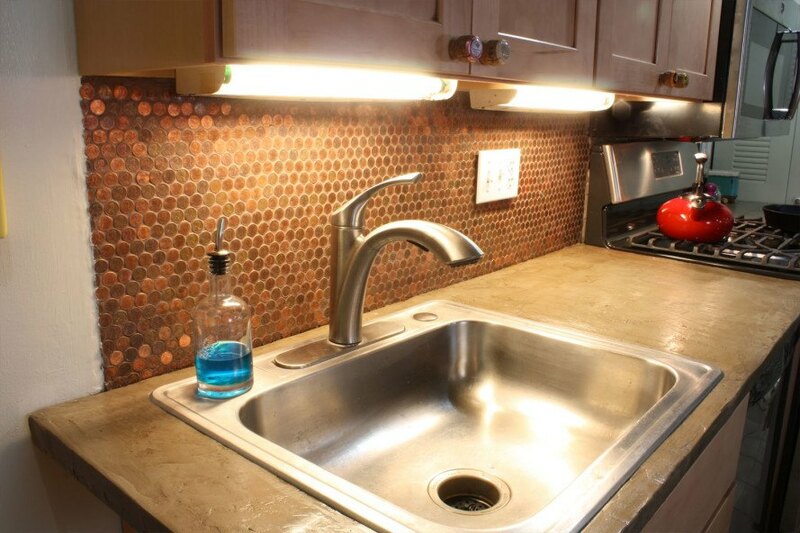 The shimmering new backsplash is clad in $30 worth of pennies. A closeup of the penny backsplash. 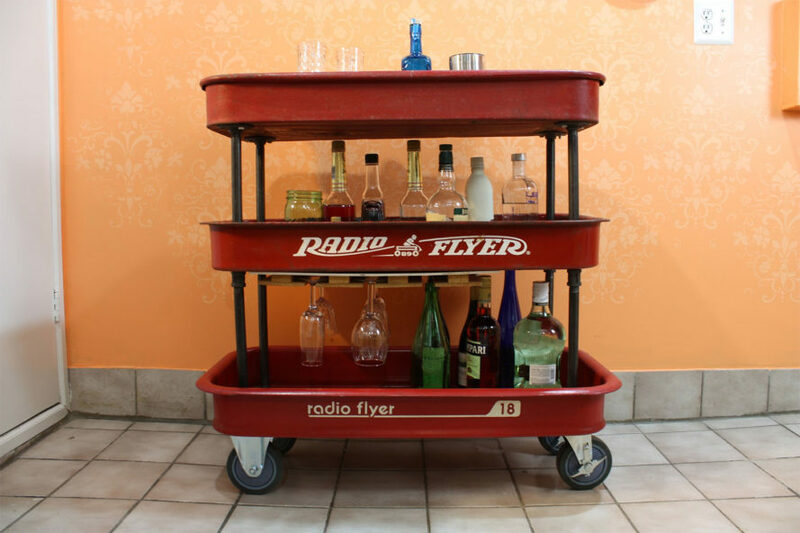 Two red wagons were transformed into a playful new minibar. An old laundry board is now a handy area for hanging notes. Vibrant plates add even more color to the prettily patterned walls. 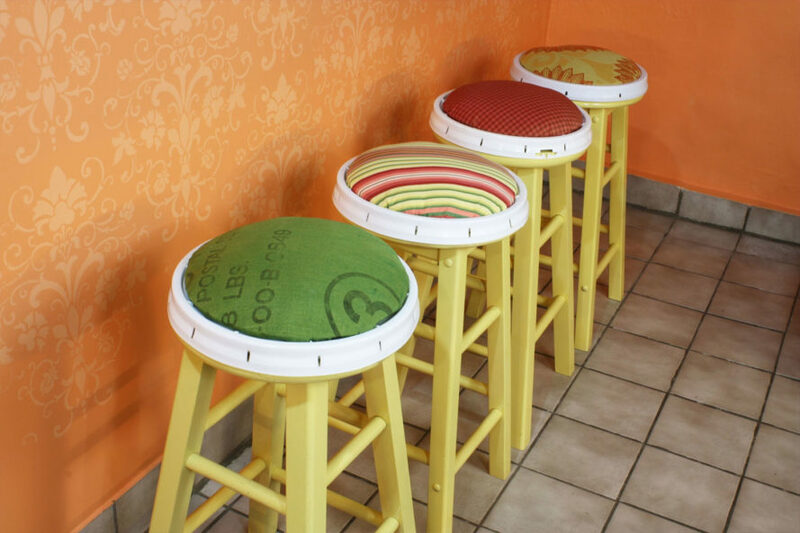 Old bucket lids and scrap fabric were whipped into new cushions for Tiffany's wooden stools. "I am loving my new kitchen and am proud of the fact that it was created from loads of love, sweat, and salvaged materials!" says Tiffany.